West Hill Hospital originated from the Dartford Workhouse. The work house was established in 1729. Workhouses gave food and shelter to the unemployed and destitute, the conditions were sparse and the life was hard to discourage entry. Those that were abled-bodied were forced to undertake hard labour in return for their keep. The workhouse was over seen by the Churchwardens and Parish Overseers. Ill health and old age were major causes of unemployment and workhouses found themselves caring for the destitute sick. Much of this nursing was done by other inmates, the care was poor. 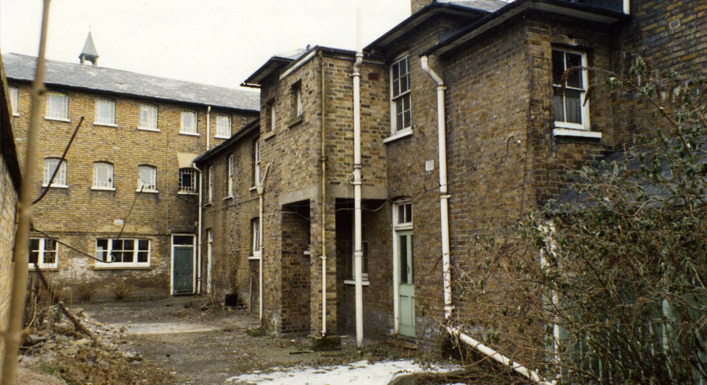 Unmarried mothers were often confined to the workhouse as were the mentally ill; the Dartford Workhouse had a special room for violent mental cases. There was a doctor appointed to look after the sick, the first one employed by the Dartford Workhouse in 1732 was Gill Smith who was hung in 1738 for the murder of his second wife and on the suspicion that he had poisoned several other people including his first wife. By 1830 the cost of poor relief had risen so much that smaller workhouses were amalgamated into one big Union Workhouse. Dartford amalgamated with 21 smaller parishes and the new Union workhouse built on the gardens and site of the original workhouse. The workhouse was now able to split up families who entered, men and women being housed separately and only able to see each other on Sunday at church. There were twelve workhouse Masters between 1836 and 1920, mostly married whose wife would be Matron. The first Matron, Mrs Howe was sacked for being continually drunk, ill treating children and trying to force a dead child into a coffin that was too small. Medical Superintendents were employed from 1836. The last was Dr Cochrane in 1933 whose title had changed to Medical Superintendent to the Institute and Infirmary. Other notable medical officers were Dr Latham, who discovered and named the Dartford Warbler after finding it on Dartford Heath. William Wilson, Naval surgeon from 1800-1814, whose son was responsible for bringing to England Cleopatra’s needle. Dr Renton who was medical superintendent from 1911 to 1933 and then Honorary Consultant until 1945. Renton Clinic was named in his honour. The Poor Laws were abolished from 1905-1909, this was done in stages and pensioners occupied the Union buildings until 1968 when the last left Phillips and Hesketh wards. The workhouse buildings became the King Edward Hospital in 1913 and were administered by the Local Government Board. In 1930 the control of the hospital passed to the Ministry of Health and Kent County Hospital. In 1935 it became the County Hospital Dartford. With the inception of the NHS in 1948 the hospital administration changed to the South East Metropolitan Regional Hospital Board and the name changed to West Hill Hospital. In 1964 Christopher, Constance, the old Robin and Renton wards were demolished. In 1891 new theatres, out patients and the accident and emergency departments were built and opened by Princess Anne. Other notable persons working at the workhouse/hospital were Louisa Newton who became Dartford’s first woman Guardian of the Poor in 1896. She struggled to make her changes as the other Guardians failed to second her proposals (she wanted butter served instead of margarine, framed prints for the walls, and that the women should have hankies and nightgowns). Her achievements included an employment scheme whereby inmates could earn extra money by doing simple handicrafts and concerts and musical evenings. Eva Branton who was a Relieving Officer to the Dartford Board of Guardians, she later became the first Housing Welfare Officer to Swanscombe Council. She died in 1952 and during her life had become a friend to the poor and eldery, a ward (Eva ward) was named in her honour. Reverend Stanley Morgan was Minister of the Greenhithe Congregational Church in 1894. He recalled travelling to Dartford to take up his post and found himself on the same train as another Stanley; this one was Dr HM Stanley, the famous finder of Dr Livingstone who was on his way to open the Livingstone Hospital. Reverend Stanley became Chairman of the hospital in 1910 and remained as Chairman for the next 25 years. He was much respected and worked tirelessly to improve the lives of the poor in Dartford. He died in 1951. The Hospital during the Wars. During WW1 the Dartford Workhouse was closed as Vickers-Armstrong was called on to produce a greater number of munitions to help fill the shortfall of the 1915 ‘Ammunition Scandal’. It needed accommodation to house the increased number of munitions workers so the workhouse became a hostel. The Government had previously tried to house these workers at Stone House but the City of London had blocked this due to the fact that it would unsettle the patients. The workhouse infirmary became a Munitions Workers Hospital; Dr Renton was recalled from France and was the surgeon in charge for the remainder of the war. During the Second World War the hospital was busy with civilian casualties. In September 1940 a bomb fell on A block killing 22 women and two nurses. Newspaper articles describe how Sister Gantry crawled in and out of the wreckage with a bowl of hypodermic needles, giving injections of morphine to the trapped women, she was dressed in her night clothes with an overcoat on. The following day she refused to go to bed and worked her normal shift. She was commended for her bravery.